Remember when 4Ks used to cost a damn fortune? Those days are quickly coming to an end, and if you need proof, look no further than Amazon’s new line of (Westinghouse-manufactured) budget televisions. They come with all the smarts of Amazon’s excellent Fire TV set-top box as well as a price-to-quality ratio that makes them appealing to just about anyone who isn’t willing to take out a mortgage to watch the game in higher quality. In its quest to take over everything, it seemed inevitable that Amazon would start selling its own affordable TV set, preloaded with Fire TV software, powered by Alexa, and designed to help you purchase as much Amazon content as possible. That’s the precise promise of the Amazon Fire TV Edition. And, honestly, it’s an appealing promise if you already use (and love) Amazon Prime. The Amazon Fire TV Edition—let’s just call it the Amazon TV from now on—includes all the basic features you’d want on a TV in 2017. It’s a cheap 4K TV with wi-fi and Bluetooth capabilities. 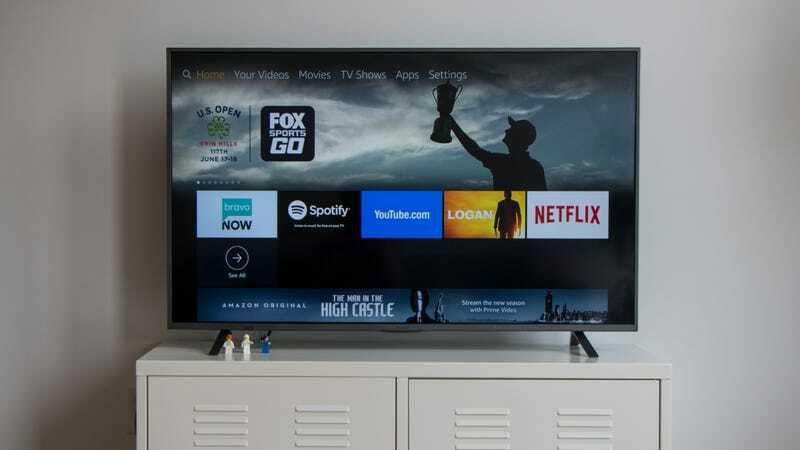 If you’re not exactly enthralled by a list of specs (which you’ll find at the at the end of this post), all you need to know is that the Amazon TV is a cheap 4K, edge-lit LED television. “Edge-lit” is the key term. More expensive TVs might use full array backlight technology that allows for local dimming and, as a result, better contrast. Edge-lit TVs, on the other hand, light up the LCDs from the edges of the screen, meaning contrast isn’t quite as awesome. Then again, you wouldn’t expect full array on a cheap TV like this. 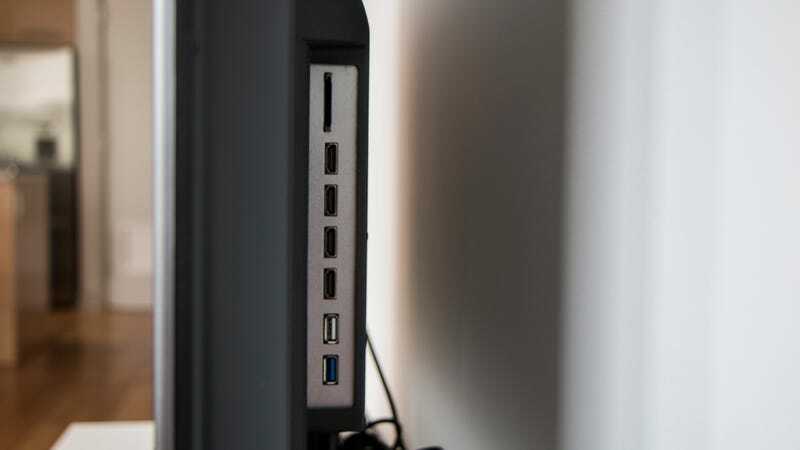 You also need to know that the Amazon TV comes complete with all the ports you really need as well as a nice Fire TV user interface. If you’re like me and have refused to upgrade your dumb Samsung TV from 2010 because adding a set-top box makes the ageing television useful enough, you might enjoy this new, all-in-one package. If you’re an OLED purist, looking for HDR-powered excellence, stop reading now. The Amazon TV is not enough TV for you. It’s great for a lot of people, who will accept the most basic levels of quality rather than spend thousands of pounds on a TV. That’s basically the point of this review, too. Amazon built a TV set for the masses, not for the enthusiasts. And it works quite well for basic TV stuff. The TV isn't available on Amazon UK yet (and we don't know when it might hit our shores), but prices starts at $450 ( £354) for a 43-inch model. A nicely sized 55-inch model costs a friendly $650 ( £511). The display itself is exceedingly satisfactory, especially after you turn off the software that attempts to boost the refresh rate. That gives you a slightly jerky movement, if you’re watching an action sequence, but the picture looks much more natural and avoids the dreadful soap opera-looking effect of the motion smoothing. The display, thankfully, lacks the shortcomings of other cheap TVs, too. There’s no colour bleeding. The whites are nice and white, while blacks are acceptably black, even in space movies like Gravity or Life. And by acceptable, I mean space looks very black—it’s not dark grey—but it also doesn’t feel like you’re getting sucked into a black hole, like some OLED displays do. The rest of the colour spectrum also looks accurate, even with the more challenging shots from Mad Max: Fury Road or Teenage Mutant Ninja Turtles: Out of the Shadows. 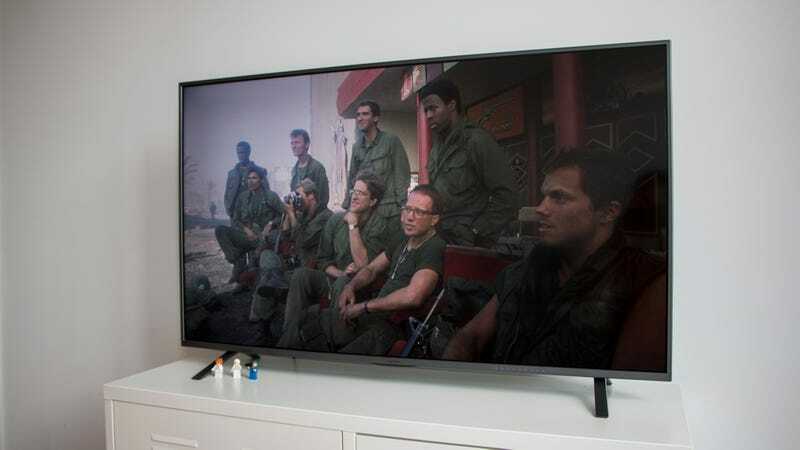 However, without higher end features like HDR or full-array local dimming, the Amazon TV’s display isn’t going to come close to upper-end models from LG or Samsung that cost five-times as much, but it’s also not as well featured as a Vizio D-Series and its full array backlighting. 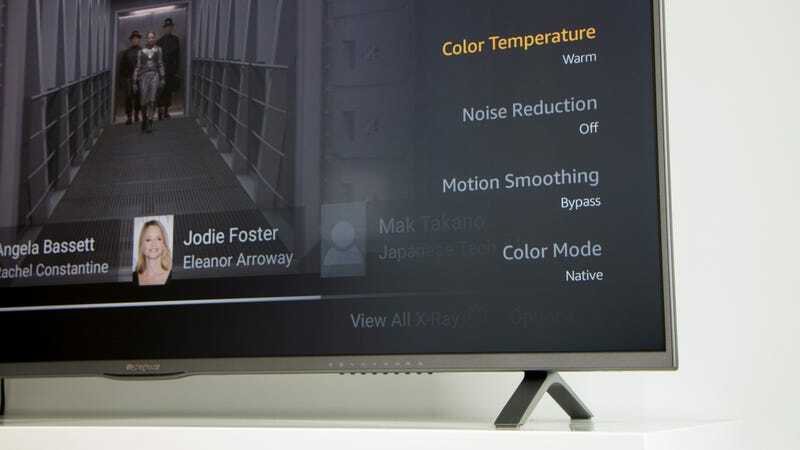 Then again, the Amazon shouldn’t be as fancy for such a low price point, although features like HDR and wide colour gamut are becoming increasingly common on TVs that cost less than £1,000. If the acceptable display leaves you wanting, perhaps the deep integration of Amazon Fire TV software will fill your heart with purpose. Unlike any other TV, this new Jeff Bezos machine starts and ends with the Amazon ecosystem. Aside from a power button and a volume toggle, the remote is almost identical to the Fire TV remote, a familiar object for anyone who owns the company’s set top box. When you turn on the TV, you’re also taken straight to a slightly modified version of the Fire TV interface. Sure, you can install and enjoy apps like Netflix, but the Amazon TV very much wants you to buy TV programming and films through Prime TV. This is great for Prime members. Those less beholden to the Amazon way of life, however, might find the setup cumbersome. Then again, Amazon makes it easy for a cordcutter to connect the TV to wi-fi, or an optional Amazon Basics antenna, then enjoy both streaming content and live TV. It’s honestly a great way to talk young professionals who have been watching Netflix on their laptops since college into finally buying a TV and/or signing up for Amazon Prime. The proposition for making the relatively cheap hardware purchase is the same one Amazon offers for Kindles and e-books. Amazon will sell you a TV at a tiny margin and expect to profit from the content you buy. That’s why you can spend around £500 on the new Amazon TV and get a piece of hardware that would likely cost more if you bought it from another vendor. This is all to say, the Amazon TV hardware is worth more than you have to pay for it. If you avoid renting too many films on Amazon Prime, it's a pretty decent 4K TV for a really decent price. You can easily avoid the Fire TV operating system by plugging in a Roku or Apple TV or, if you dare, a Sky box. You could even try using a Blu-ray player and enjoy the rather satisfactory 4K resolution. And if you’re already a Fire TV enthusiast, you’ll love the deeper integration on the Amazon TV. I’m a Fire TV guy, and I honestly love it. At the end of the day, you can definitely find a non-Amazon cheap 4K TV. If you’re willing to part with £1,000 or more, you can enjoy even better picture quality with features like local-dimming, Dolby Vision, or a quantum dot display. If you’re considering the Amazon TV, though, chances are, you’re trying to spend as little as possible to get an essentially adequate idiot box. That’s exactly what the Amazon TV is. It’s adequate, and I like it. A solid display at a refreshingly affordable price. Lots of Amazon integration (take it or leave it). Plenty of ports and smart TV features with a Fire TV operating system that updates automatically.